He doesn’t get the difference between a burrito and a fajita. ‘Why have different names, when they have essentially the same stuff in it’….. I don’t have any witty piquant rhetoric for it. So I try to elucidate the serving styles which are remarkably different. Also the analogy that we have million names for chappathis which are made in slightly varied way doesn’t convince him either. 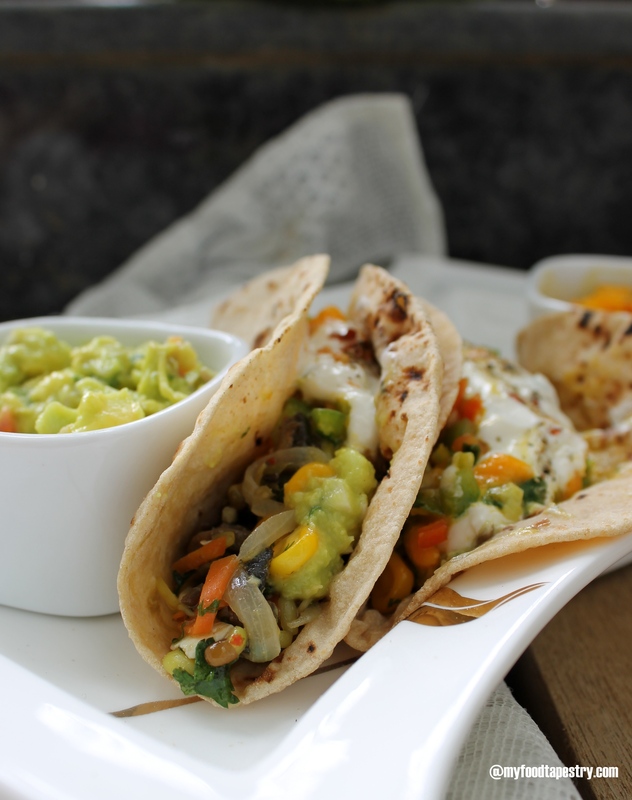 Spicy Mexican Fajitas – Vegetarian! He absolutely loves Guacamole, then top with some sour cream and a bit of more lime and I know for sure, the lunch is good. But its the stuffing that I am weary about. To substitute the meat, I sauté mixed sprouts with some julienne veggies. Ah.. this was going experimental. 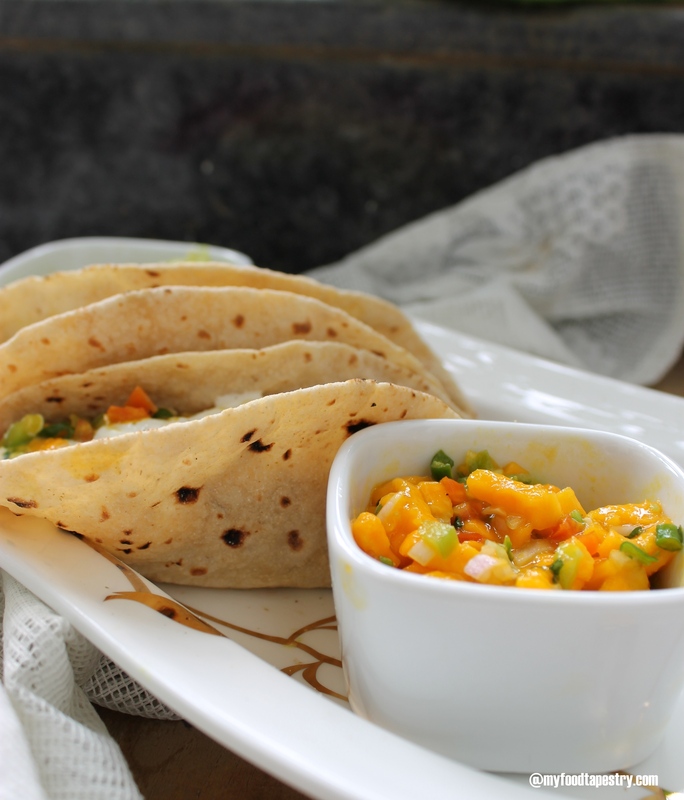 I add another succulent sweet sour salsa to top – the mango salsa. What am I doing? 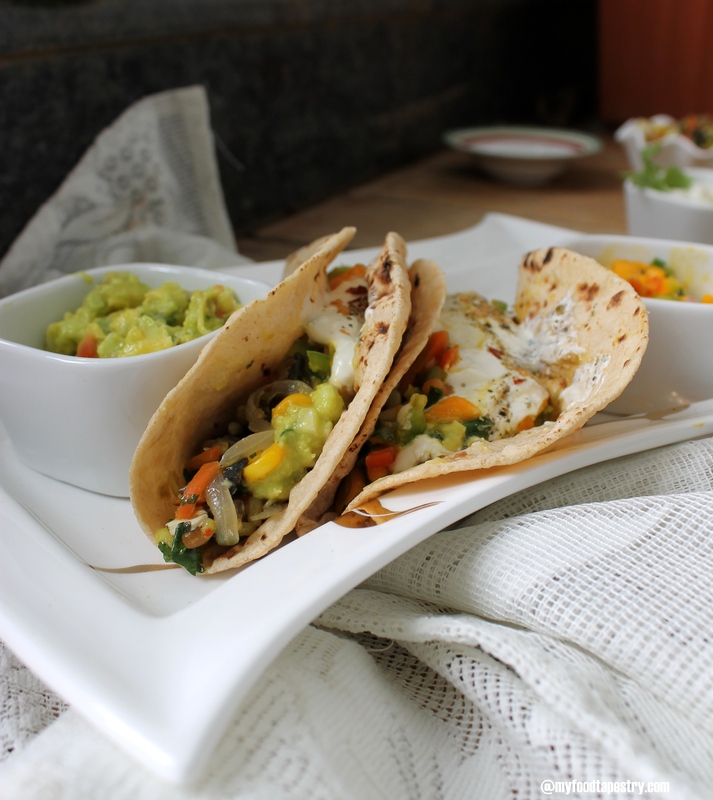 ?….I am combining disparate flavours and hoping for it to be devoured like never before. Sigh! Wishful thinking this. 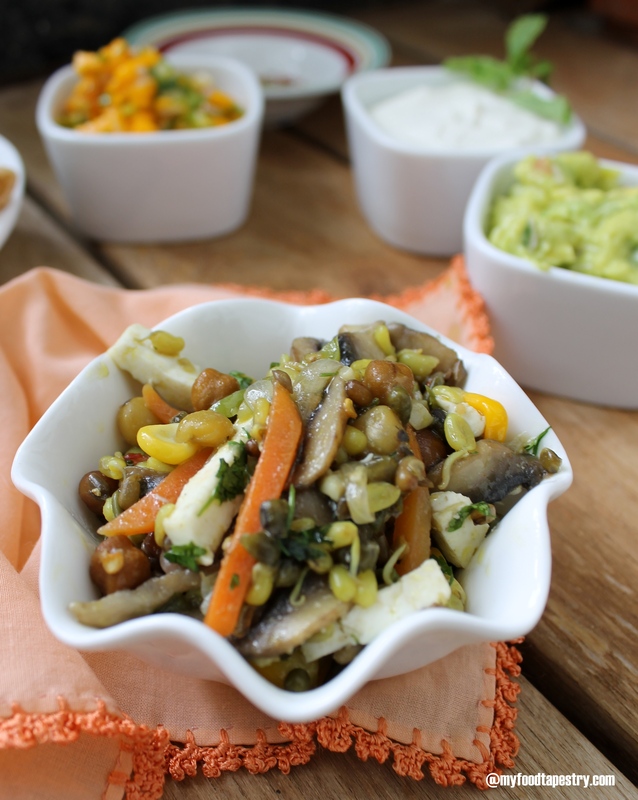 Ideally beans/rajma is used in the vegetarian version of Tex Mex cuisine. But I had a bowl of sprouts to finish before they went bad. Bored of its presence in salads and currys, the family ostracized these protein rich germinated grains. But when you throw them in a wok full of thinly sliced veggies, and season with herbs they are so delicious, you forget that you hated them a while back. Heat oil in a wok, stir fry garlic, green chilies and onions till they turn translucent. Throw in the other veggies, along with salt and pepper. Cover and cook till almost done. At this stage, add the parboiled sprouts along with oregano and chopped cilantro leaves. Mix well. Keep aside. Another surprise that day was the sour cream. 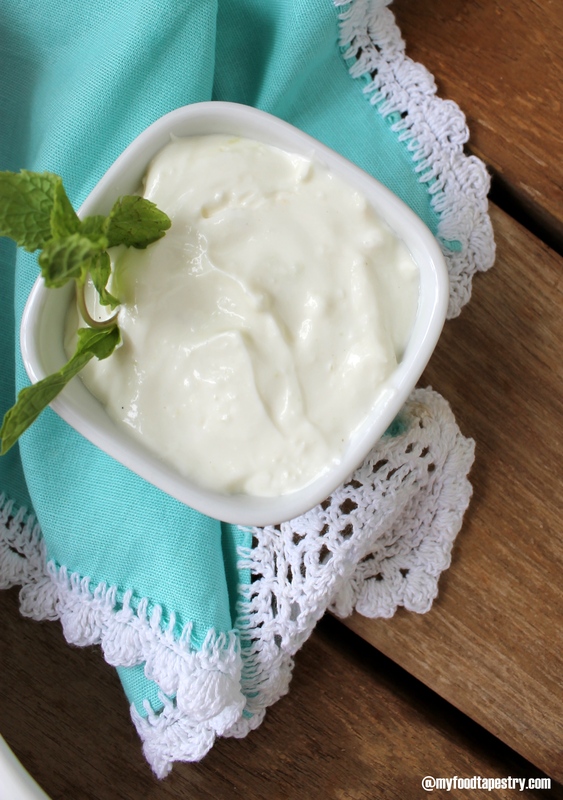 I made a faux one with yoghurt – its fat free and healthier! Tis so easy peasy, that I find myself making it every other day now. In a cup of hung curd, add juice of half a lime, crushed garlic, bit of pepper powder and salt. Mix in a tbsp of cream. Churn or mix well for a creamy consistency – Thats it!! 4 flour tortillas, I used whole wheat. You can use flour or corn, anything you like. 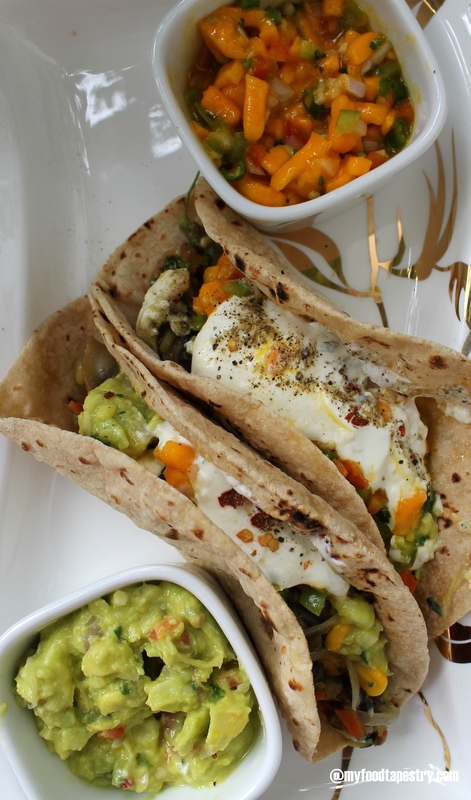 Warm each tortilla, place 2 table spoons of the sprouts veggie mix, top with guacamole, salsa and sour cream. Sprinkle taco seasoning. Serve immediately. 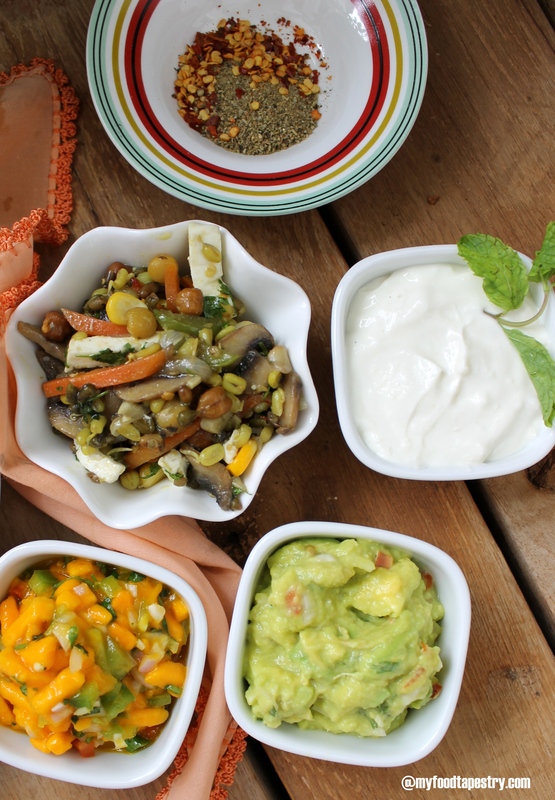 Note: Go experimental by replacing mango salsa with tomato or peach salsa. Yummy!!! I love the first picture. Beautiful gorgeous recipe. Sour cream substitute is a must try. Yes Chaaru, please do try this mock sour cream. I would have licked the plate clean Namrata. Loved your spin on sour cream. Gotta love Mexican cuisine. It’s so easy to customize too, like you’ve done here! I customise – a lot!! Husband has to make things clear before hand when he is no mood to indulge my crazy experiments. Wow, is sour cream that easy to make? I avoid the ones from the shops because of gelatin in the ingredients. The whole spread looks great, Namrata! Yes, its easy isn’t it!! Let me know how yours comes out. Thank you Bonnie, I digg yours! Splendid photography u do.